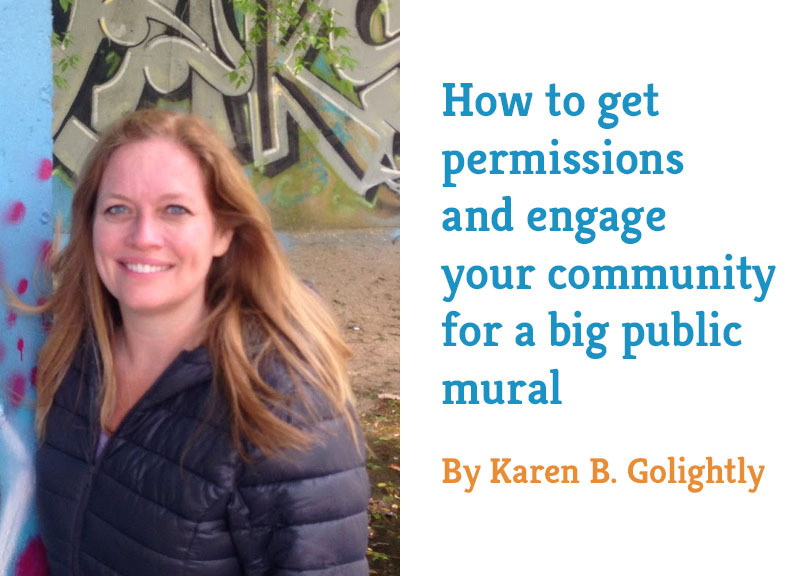 If you’ve ever been involved in a public mural project, then you know how deceptively simple this booming genre of community activism can seem, to the uninitiated. Hire an artist, slap it on, make it pretty… right? Wrong! Community murals are very, very labor-intensive – even if a professional artist is on the team. From fundraising, to power-washing the wall, to the complexities of designing and mapping such a large image, to scaffolding, to selecting climate-appropriate paint, to coating it all with UV protection at the end, to lighting installation, to protecting the work from graffiti, this kind of job is no cakewalk. But it’s worth it. Murals bring people together. Neighbors stop and look, and wind up chatting. Mural helpers and contributors across the country burst with pride at the sight of their work. Just ask Jennifer Chappell, who in her free time works tirelessly on her community council and as a Creator with Three Points Beautification, in Louisville. 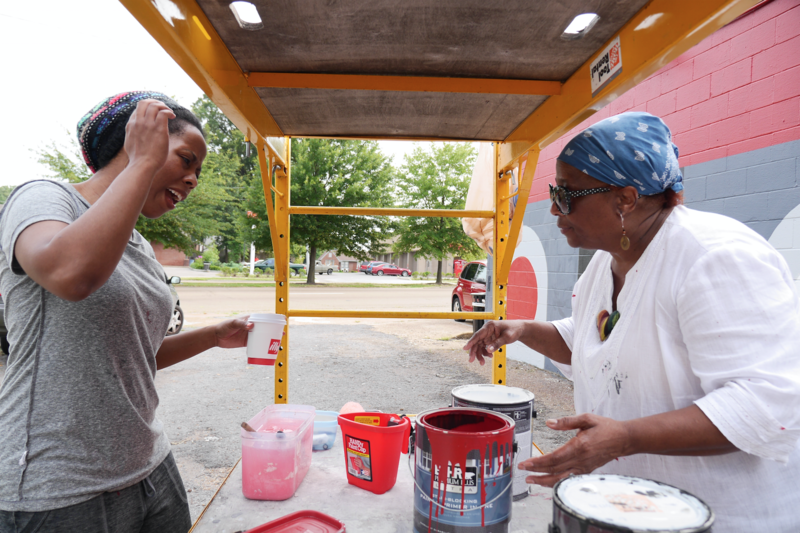 She’s spearheading an ioby campaign that’s raising money right now to cover a portion of costs for a new mural on a run-down commercial building on Goss Avenue, in Louisville’s Three Points area, where she lives. 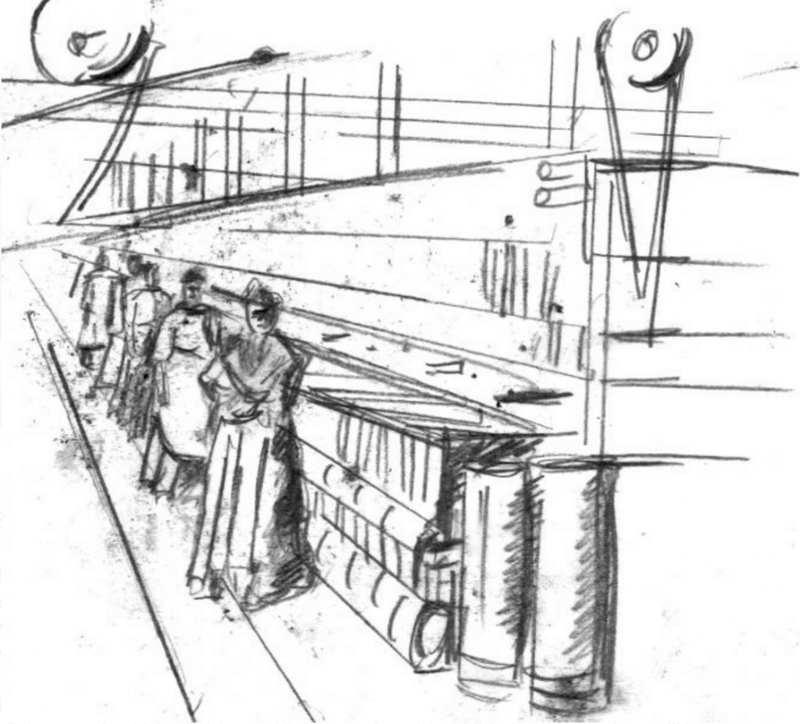 The mural’s concept is absolutely fascinating: it’s going to visually represent the Louisville Cotton Mill and Glassner’s Bakery – tenants of the building generations ago – as well as Ackerman Millworks, who are the current building tenants. It’ll be done by artist Stephen Paulovich, and in such a way that if you stand out front, it’ll look as if the building has been spliced down the center, so that you can peer right in to see women spinning cotton, men working wood lathes, and bakers kneading bread. On another side will be a reproduction of an old photograph of a Glassner’s Bakery truck. Maybe Chappell’s tirelessness comes from seeing so clearly what a difference her work is making. Passersby often roll down their windows and shout “thank you!,” if workers happen to be on the site. “It’s so heartwarming,” says Chappell, who actually cried the first time she sat down in the newly installed bench, and who’s also noticed that neighbors have been taking it upon themselves to quietly contribute, when no one is looking. Recently, someone went and repainted an old fire hydrant in the area; now it’s a nice, bright red again. Someone else staked a tree that had been bumped by a car. Another person did some quiet weed-management. These selfless neighbors, like Chappell herself, aren’t getting paid for it. They’re not in it for the glory. They just feel compelled to give a little, make things a little nicer. Neighborhood investment breeding neighborhood investment. To donate to the mural, visit the campaign page here. More than $3,000 has already been raised, with 26 days left to raise the remaining $2,135. A $20 donation gets your name on the mural, and $200 or more gets your glowing FACE up there! Pssst…. In OTHER ioby news: Want to learn from the pros about how to bring healthy cooking into the classroom? Check out last week’s Learn From A Leader blog, and get tips on designing curriculum, getting equipment, and teaching good food habits. Give it a read, and you’ll be ready to start! ioby is more than just a crowdfunding platform: we’re a team of individuals who are passionate about helping neighbors make their neighborhoods safer, greener, more livable and more fun. We love hearing from ioby Leaders about their experiences planning, funding and implementing a project with us. We think by sharing these experiences, complete with both triumphs and roadblocks, we can help spread knowledge and maybe even inspire others to take action towards positive change where they live. 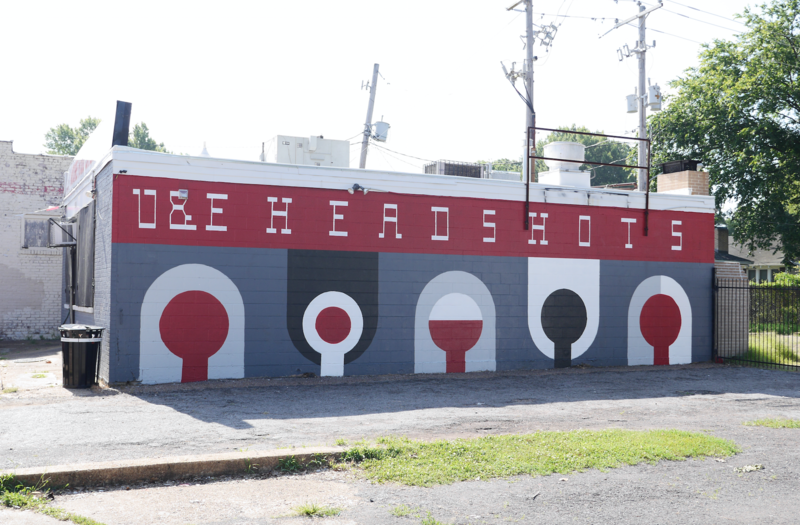 As a self-identified sign-hunter, Khara Woods is always on the lookout for street art in Memphis. On leisurely walks through her hometown, she documents property signage and graffiti as reference for her graphic design and hand-lettering projects. 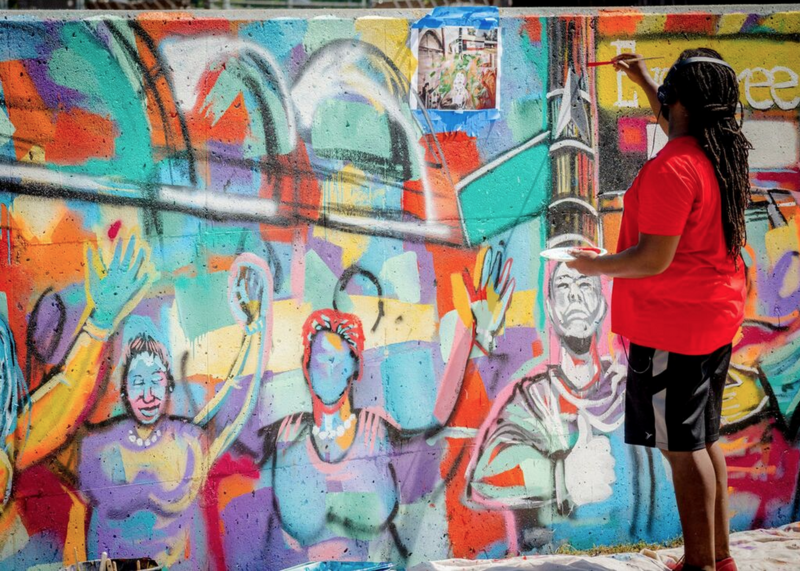 One day in midtown, Khara stopped in her tracks and took notice of a colorful new graffiti-inspired mural on a formerly unsightly wall along Lamar Avenue. The stark contrast between the mural design and surrounding disrepair drew into focus the strange mix of rapid transformation and neglect that for her characterizes the historic neighborhood of Rozelle-Annesdale. The wall sat adjacent to a freeway that now the divides the area, which was formerly a bustling corridor for residents and commuters. Her curiosity piqued, Khara was determined to track down the artist responsible and soon learned that the art was one of eight installments comprising the “Paint Lamar” ioby campaign led by Kyle Taylor. Khara kept ioby on her radar. She bookmarked the site to her browser and checked in periodically. She also sent the link to her mother. While Khara scouts emerging street art, her mother NJ Woods keeps busy as a “primitive folk” artist building on a collection of self-portraits depicting Mid-South and Civil Rights- era living. For some time now, they had been looking for a way to collaborate, and they had an idea to work on a large scale public mural together. They had applied for grants, responded to city RFPs and sought funding from arts commissions to no avail. Feeling defeated, they tabled their collaborative project until they had the resources to execute on their own terms. 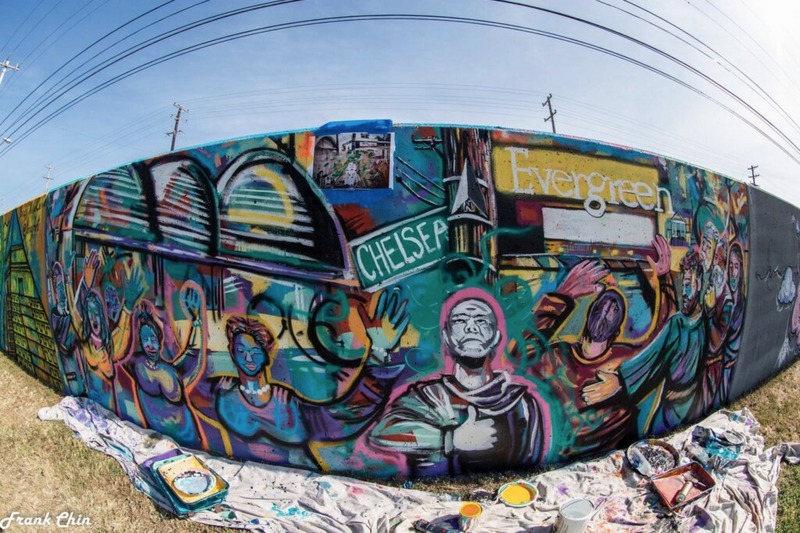 In the early stages of ioby’s 85K Memphis Match, Khara skimmed our blog announcement and promptly got in touch with our office to float a question about what permission she’d need for a potential public mural project. After connecting with ioby’s Ellen Roberds in person at an Urban Resource Center meeting, Khara shared her concerns about her lack of fundraising experience and navigating permissions for public property use. Drawing on her local relationships, Ellen facilitated introductions between local business owners, weighed in on potential sites, and even proofread Khara’s draft emails to property owners. 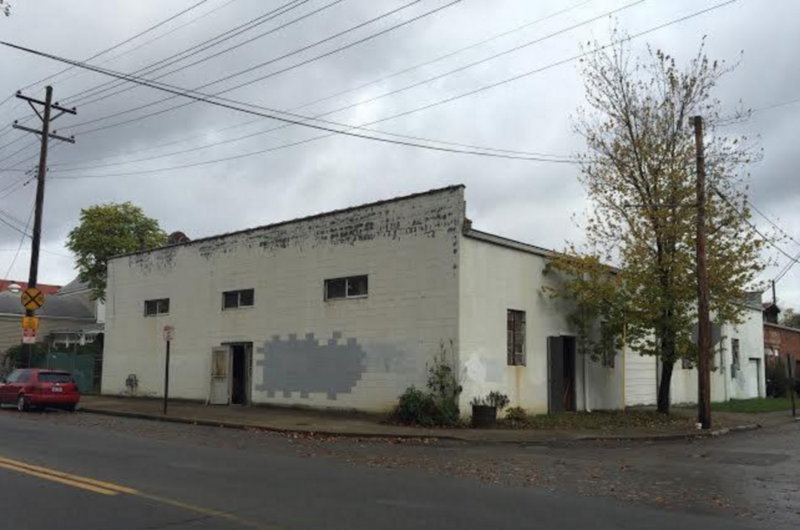 After much back and forth with local stakeholders, Khara secured the site of a welcoming local eatery in Midtown: Moore Food Company. Launching their ioby campaign “Headshots”, Khara and NJ quickly racked up match funds for their $1,000 funding goal for wall clean-up materials and paint supplies. Inspired by NJ’s past collage work, the mother-daughter pair spent a couple of weekends rolling out a cast of minimalist geometric figures to represent the diversity of their Memphis neighbors. 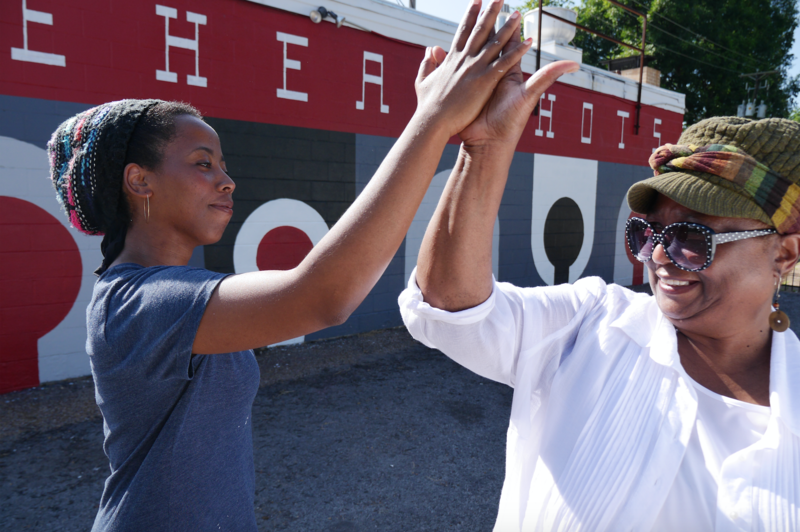 After Khara and NJ’s mural went up on behind the Moore Food Company, the restaurant saw business profits spike – their beautification project was clearly doubling as a placemaking success and a striking new neighborhood landmark! Khara and NJ’s mural project reminds us that fundraising is just one of many barriers that can stand in a way of potential leaders starting a project. After being burned by grant opportunities, Khara felt discouraged by bureaucratic language, sluggish timelines, and by veteran organizers competing over resources for public arts projects. When the Woods pair came to ioby with the vision to get their project off the ground, ioby provided the footing they needed to ask for buy-in from their community. Ellen’s guidance throughout the process speaks to one of ioby’s core principles: we believe that our neighbors know what’s best for their neighborhoods. While we’re confident that local residents are the ones best equipped to make on-the-ground change, our hands-on approach offers leaders the chance to build confidence and expand their skillsets. We’re here to affirm ioby leaders’ right to improve their neighborhoods and to guide them through unforeseen hiccups along the way. ioby is proud to be a part of Headshots fundraising success and we hope it’s one of many for the Woods family! And remember: if you’re ever headed east from Downtown Memphis, keep on the lookout for the Woods’ bold and whimsical 10-foot geocentric headshots to jut into view. At ioby, we are lucky to be surrounded by experts from across the country. Our ioby Leaders can do some amazing things; They can build bat houses, make beeswax candles, teach kids how to tell stories through dance! And best of all, they’re not stingy with their knowledge. That’s why we like to feature some of our favorite Leaders in our Learn from a Leader series. We hope you enjoy! This week we hear from Karen B. Golightly, a graffiti photographer and one of the three main organizers of Paint Memphis. Her photos and articles on graffiti and public art have been published nationally and internationally in literary and art journals, such as Triggerfish Critical Review and Number magazine. Paint Memphis sponsors a one-day annual paint festival to create public art in unusual places. In 2015, they created Memphis’s largest collaborative mural, which was also its first city-sanctioned wall for public art. Get permission from the City—with some friends. This might be the hardest part! Memphis spent so many years trying to cover up graffiti that officials had a hard time understanding why they should now condone it; it literally took us years to reach agreement. We finally got there by doing a presentation to the Office of Engineering and Public Works showing how beautiful the public murals in St. Louis are, and how this is all about community—it’s not a threat! We also partnered with a local environmental nonprofit that wanted to beautify the floodwalls lining their recreational trails. It’s better not to go into this looking like one crazy person—get some backing! Figure out your budget. If you’re not familiar with calculating mural costs, ask someone who is. The other Paint Memphis organizers had a better idea than I about how much time and paint (both spray and bucket) we would need. We approached Home Depot, and they donated a lot of primer, paint, and volunteer labor (we shouted them out in our press release); paint brands Glidden and Behr and a local contractor also made donations. Our muralists also chipped in themselves by buying some of their own paint; about half of what we needed total. Remember that the bigger the wall, the more expensive it will be! Clean and prime. After appealing to the chief of our fire department for months, he understood that pressure washing was an essential part of the mural-making process, and agreed to help us. Once it was clean, Home Depot employees volunteered their own time to prime the wall. Get volunteers! We sent one press release, and had our ioby campaign and a website, but most of our buzz stemmed from the nature of the project: graffiti is cool! A lot of people spread the word through their own social networks and really showed up to help with prep and cleanup, press, professional photography—everything! We also had organizations reach out to see what they could do; one volunteered to clean along the wall after the mural’s completion. Choose your painters and prep for the day. We gave local and regional artists whose work was really good first dibs on painting, but artists from as far away as South Korea eventually heard about it and got involved. We organized the artists along the wall to alternate between solo muralists and crews; many developed their pieces to fit together, so we planned for them to work side by side. A local restaurant donated a barbeque lunch, and another sponsor donated water. All 70 artists were so grateful to come out and share their work. If you’re in a hot climate, don’t do this in the middle of the summer! After you get permission from the City, six months should be enough time to organize, provided you’re working with a committed team. We raised $2,500 and got a separate $500 donation, which was enough to buy half the spray paint; we needed an additional $2,000 for bucket paint and priming. So the materials total was about $8,000—but that was for a floodwall a third of a mile long and seven feet tall! We wanted it this size to make an eye-catching statement and a real community movement for Memphis, but you don’t have to start so big. In addition to all the usual paint and priming supplies—brushes, rollers, buckets, tarps, etc.—don’t forget to have tons of water and snacks on hand for everyone! – If there’s a person in charge of public art in your city’s administration, reach out to them (of course)!